my Ink well: Happy New Year! 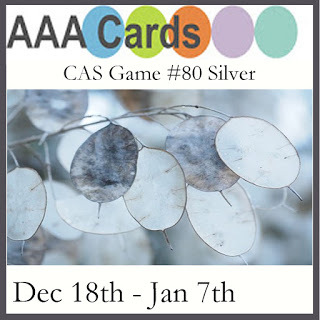 Time for the last AAA CAS Cards Challenge of 2016 where the theme is SILVER! Please not that this is a THREE week challenge this time, running from December 18th to January 7th. First place winner will receive a $20.00 Gift Certificate to the Stampendous Store. Our Guest Designer for this challenge is the very talented Deborah Frings of Deborah's Gems. Take a stroll through her blog, and I am sure you will be very inspired! Now, on to my card. I must tell a funny story about it. During the time leading up to the challenge, I had it in my head that the theme was GOLD despite the fact that I had many reminders on calendars and on lists etc, that it was SILVER. I made my GOLD themed card, I was very, very happy with it. When I went to post it with the rest of the DT cards, I noticed that everyone's card was silver, as was the header for the challenge. Just a funny example of how crazy things are right now. I had a big belly laugh over that one. Then I re-made my card in Silver. LOL!! I die cut the word "Cheers" using PTI's Luxe Silver Adhesive Sheets and Uncorked Word Die and adhered it to the inside of the card. Ink~Tsukineko Delicata Silvery Shimmer Ink, VersaMark. Accessories~PTI Uncorked and Uncorked Word Dies, Pretty Pink Posh Window Frames Dies, SU Silver EP, Little Things Sequins. SU Distressing Tool. 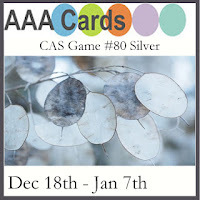 Please head on over to the AAA CAS Cards Challenge Blog and check out the wonderful silver themed cards created by the awesome DT. 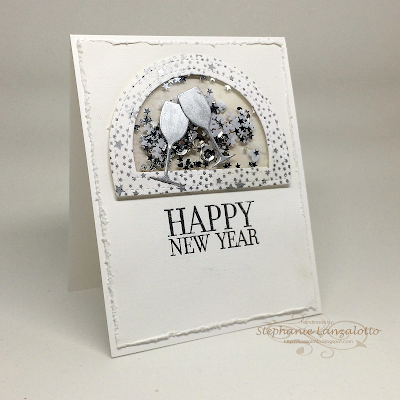 Get in spired to make a silver themed card of your own, and link up to play with us. Bottom right photo with lots of silver and stars. That gave me a giggle! So much on here yet still so perfectly CAS, bet it looks fab in gold too! BEAUTIFUL creation Stephanie! Isn't it amazing how we know it's to be one thing and STILL do what's in our minds! LOL Well it turned out gorgeous and love that it's a shaker ... very creative! Thanks so much for joining in the fun at our Double D ‘Dreaming of a White Christmas’ challenge! We hope you’ll come back often. 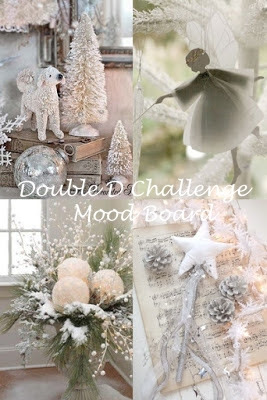 Oh, my word, this is so cute and fun and festive! Funny story... I would have been pretty frustrated! But now you have two fabulous cards! Thanks for playing along at Double D! Hahaha too funny Stephanie!! I still think you should have gone with my post a black and white photo suggestion ;) save it for 2017 NYE and we will do a gold theme then! Anywho - love the card - I have a soft spot for shakers but they're hard to make CAS and I think this really worked well. Also you used one of my favourite background stamps ever!! Fabulous! I love how you made this a shaker card and the silver glasses are a perfect touch! How funny that you got the colours mixed up. Stunning shaker, looks superb in silver - bet it does in gold too!